With the blessing of His Holiness Patriarch Kirill of Moscow, the Synodal Biblical-Theological Commission has published a draft version of the Catechesis of the Russian Orthodox Church for Church-wide discussion, reports patriarchia.ru. The final section on the Russian Church’s attitude towards the non-Orthodox has caused some consternation. Therefore the document states that, “The Church condemns those who, by using inauthentic information, deliberately distort the task of the Orthodox Church in her witness before the non-Orthodox world and consciously slander the Church authorities, accusing them of the ‘betrayal’ of Orthodoxy.” Such sowers of temptation, according to the document, ought to be subjected to canonical sanctions. The statement included from the Thessaloniki meeting refers not only to schismatics, but also to “certain extremist groups within the local Orthodox Churches,” who “[use] the theme of ecumenism” to criticize Church leadership, “thus attempting to create divisions and schisms within the Church,” seemingly accusing all who oppose Ecumenism as being among those who use “inauthentic information” in the fight against it. Not all accept the view that Orthodox representatives have never, without exception, compromised any matter of Orthodoxy at ecumenical gatherings and dialogues. Many prominent voices within the Orthodox Church, including St. Justin Popovich, Elder Ephraim of Katounakia, St. Paisios the Athonite, St. Seraphim of Sobolev, Fr. Seraphim Rose, Metropolitan Hierotheos (Vlachos), and many others have been very vocal about the dangers posed by the Ecumenical movement, and following last year’s council on Crete, entire Local Churches have raised the flag, including the Bulgarian and Georgian Churches. The February 2016 joint declaration between Pat. 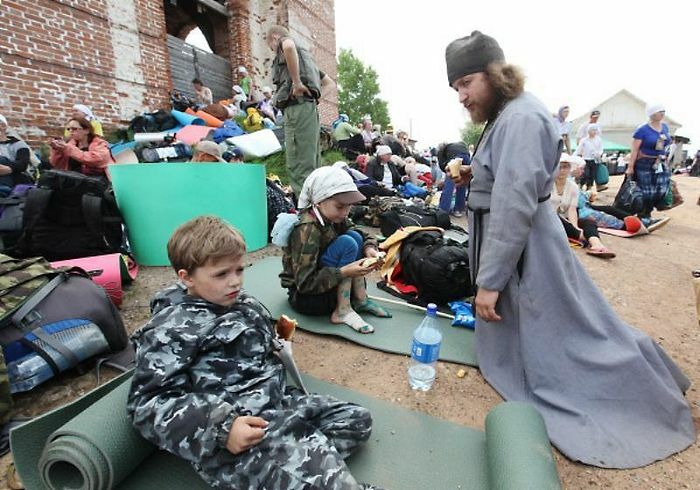 Kirill and Pope Francis also garnered criticism. For instance, Fr. George Maximov wrote that the document contains expressions “which are by no means indisputable, and sometimes erroneous,” and Dcn. Vladimir Vasilik wrote, “The joint declaration signed by the Pope and the Patriarch leaves one with mixed feelings… there are a whole series of formulations in this document that evoke well-founded anxiety… this meeting was in many points unsatisfactory.” Fr. George also wrote a critical response to the September 2016 gifting of a particle of the relics of St. Seraphim of Sarov to the Pope of Rome. Canon 15 of the First-Second Council, held in 861 in Constantinople under the chairmanship of St. Photios the Great, states that if a bishop openly declares a heresy previously condemned, a priest may cease to commemorate him without ecclesiastical sanction. This “walling off” is not considered a schism, but the same canon states that if a priest ceases to commemorate a bishop over a heresy not previously condemned, then his action is considered one of schism. Having received no explanations over the course of two months, Fr. 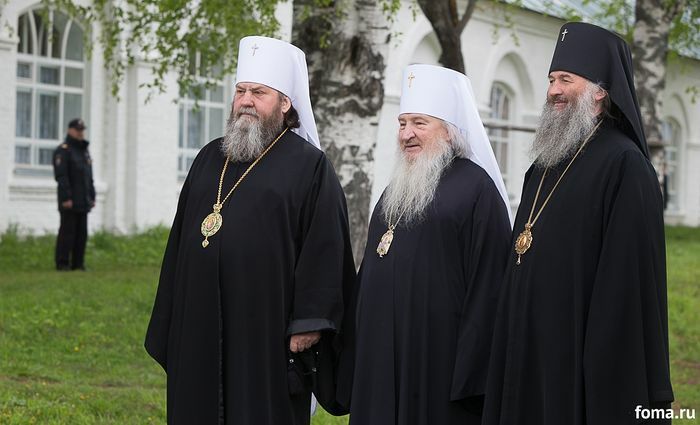 Artemy writes that he is ceasing commemoration of and thereby breaking communion with the three bishops, and any others who agree with the patriarch’s words, and that the decrees and punishments of the mentioned bishops are accounted as nothing to him. The full text of the draft catechesis can be found at theolcom.ru, and reviews are being accepted at catechism@theolcom.ru until November 1. Caught on Camera! Real Russia Revealed!! Look at all those long beards! Muslim lovers! Only blood-drinking vampires wear long black robes! Look at that swarm of Russians! 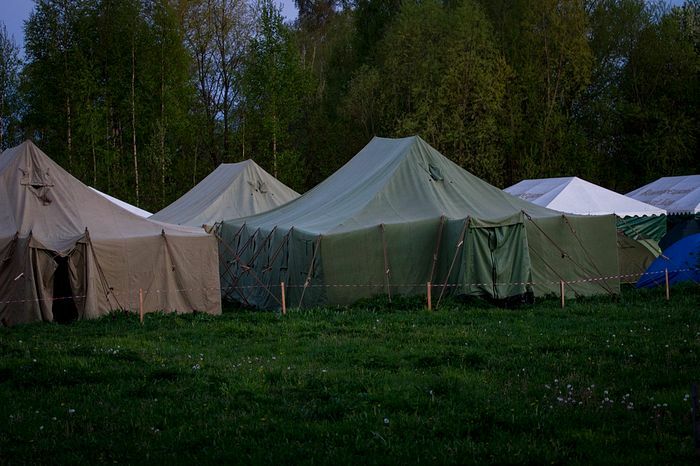 Don’t let the civilian clothing trick you: They are training to invade the Baltic countries! TEH kiddie SPETSNAZ!! Ready to hack into the ‘Murcan education system to give your kids D’s and F’s on their report cards!! Any good Evangelical knows that icons are demonic. America is the ultimate target! Look at them scheming in their tents! All your base are belong to us. This is the view of Russia that the globalists at The Weekly Standard, CNN, NPR, National Review, etc. want you to believe. Maybe, however, the Russians really do want to live the traditional Orthodox Christian life of the Holy Apostles and all the Holy Fathers (which their own forefathers received at Russia’s baptism into the Orthodox Church more than 1,000 years ago in 988 A.D.) without interference from the demonically inspired, post-Schism West; without State Dept.- and CIA-directed color revolutions in the name of ‘constitutional values’; without Wall Street funded coups that fill the streets with violence and soak the earth with blood. 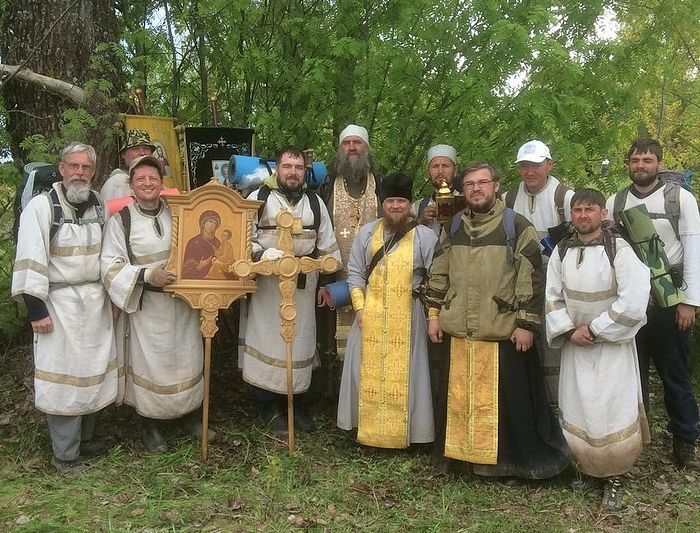 Maybe the people in these pictures really are pious Russians on pilgrimage, seeking closer union with the All-Holy Trinity, His honored friends the saints, and themselves. The anxiety had been mounting for weeks, and now over breakfast on the first day of the Velikoretsky pilgrimage there was no escaping the feeling that I may have made a terrible mistake. 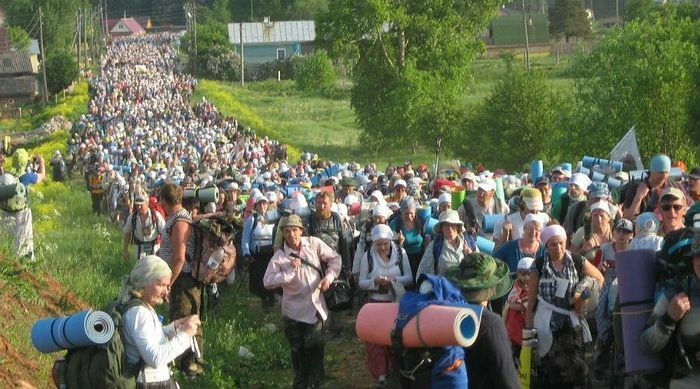 I had seen a Russia Today short programme about the oldest, longest, and largest walking pilgrimage in Russia, how, although very much suppressed in soviet times, it was not only allowed, but now hugely popular. An inner feeling had developed that I wanted to experience this event and to be a small part of the religious revival in Orthodox Russia. So, visas obtained, injections endured, and all manner of unaccustomed items bought—a rucksack, sleeping mat and foam-roll, and (I thought they might be useful) many packets of Kendal’s Mint Cake. Anyway, now, on this first morning there was no way out so we went, as arranged to the entrance of the Trifonov Monastery in Kirov where the procession was about to begin. 105 miles to go, in a six-day round trip. 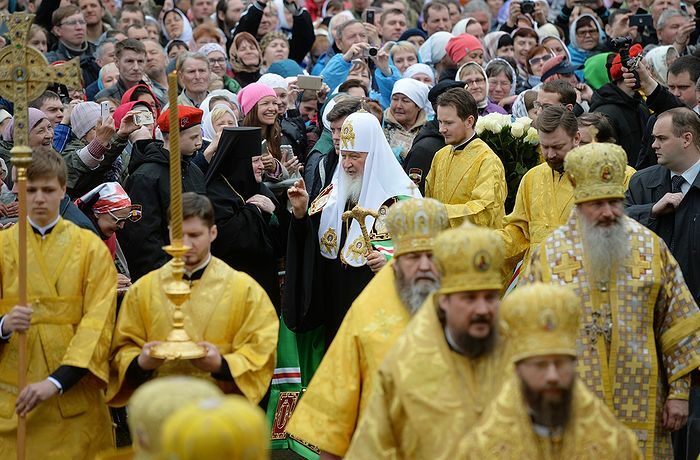 Already the choir was singing the end of the Liturgy, and hundreds and hundreds of people were arriving—every minute more and more until, through the archway colourful banners, priests and the wonderworking icon of St. Nicholas proceeded off down the road. We had been adopted by Anastasia who was the English teacher to students at the seminary “you have a blessing to walk with us at the front” she had told me and then we jumped in to the huge stream on people as the choir continued to sing. In fact, the choir sang all week from three o’clock in the morning until we stopped in the evening—through the streets, the fields and the forests as we walked—all ages, all types of people, men, women, and children, priests and monks, nuns. Many pilgrims wearing icons round their necks, some walking barefoot. So the pattern was established—we walked for about two hours, then the icon stopped, a moleben sung, and thousands of people found a patch of field to unroll their mats, lie down for a rest and perhaps have some tea or a snack, then on out into the countryside and road which gave way to a path, and the path to mud and the mud to large path-blocking puddles. The miraculous icon was found in the forest by the river Velikaya in 1383 by a peasant who saw it bathed in light as if surrounded by many candles. A small chapel was built, miracles wrought and pilgrims started to seek the aid of St. Nicholas. When the icon was later moved to the monastery in the regional capital of Kirov, it was on the understanding that each year at the beginning of June it would return once again to where it was found. Under communism the pilgrimage was officially banned and as late as the Khrushchev period anyone in even the smallest group of walkers heading there was turned back. By the year 2000, the full route of the ancient pilgrimage was allowed, and now some 40,000 people walk and pray and sing and do so with what I can only describe as a deep sense of joyfulness. May the Lord, through the prayers of the Most Pure Mother of God, help the South to know who her friends are. Should Western Civilization Be Defended?